If you live in Malaysia, you know that you are very lucky where FOOD is concerned. Malaysians are known for the special relationship that they have with food which is evident from the variety of savory dishes and sweets that one can easily find at every corner. This is especially so during the many festive seasons, one of which was only recently celebrated – Deepavali. One of the favorite Indian sweets eaten during Deepavali is Sugared Ghee Balls, which is also popularly known as â€œNeyyi Urundaiâ€ or â€œPayatham Urundaiâ€. True, compared to the other more gloriously colored sweets found during this festival, Ghee Balls do not get full points for looks. In fact, its unstimulating colour and simple shape may even be a â€œput offâ€ for some. But, for many who have tried it, this sweet has easily become a favorite. Making it from scratch is relatively easy. The only tricky part is pouring the hot ghee into the flour mixture and molding the balls into shape. One may find that the first few balls take a longer time to make than first anticipated. Donâ€™t let your spirits down if you find this happening to you. Persistence pays off and it wonâ€™t be too long before you start getting the hang of it. Once cooled, pop a ball into your mouth and enjoy the taste as it slowly crumbles into a wonderful sensory delight. You wonâ€™t regret it! 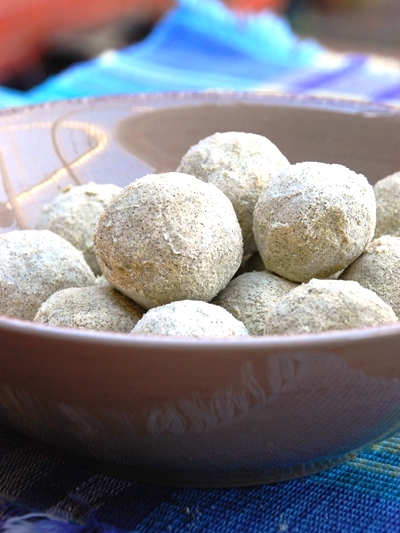 This is my recipe for Sugared Ghee Balls. If you are using unroasted moong beans flour, you must first dry roast it. Do this by heating a large frying pan or wok to low-medium heat. When the pan or wok is hot enough, pour in the flour and dry roast it until fragrant. Remove from heat and let the flour cool. Mince the roasted cashew nuts into tiny pieces (but not ground) and keep aside. Once the flour is cooled, pour it (2 cups) into a large dry mixing bowl. Add the icing sugar, minced cashew nuts and salt. Using a wooden spoon, mix all ingredients together. On a separate large plate, put in the rest of the roasted moong beans flour (1/3 cup) for coating and keep aside. When ready to make the ghee balls, heat a small quantity of ghee (approximately Â½ cup first) in a small pan, on low heat. Donâ€™t overheat the ghee, but it has to be reasonably hot. (As you use up the hot ghee, add more to the pan if required.) As you make the ghee balls, the ghee pan should remain on low heat close by. Remember to be keeping an eye on it the whole time! To make the ghee balls, use another wide shallow bowl on which you can comfortably work on. (I like to call this the sand-pit). Pour in half the mixed ingredient and loosely spread it around the bowl with your fingers. When you are ready to make a ball, heap a little of the flour (slightly more than what is needed for one ball) into the middle. With a small spoon, make a small â€˜wellâ€™ in the middle of the heaped flour. The well should only go about 1/3 down the heap and not all the way! Pour in about 1 tablespoon of hot ghee into the well. You will notice that when the hot ghee is poured, the flour will sizzle a little. Using a spoon, slightly press the heap allowing for the oil to â€˜catchâ€™ the flour. Then, carefully, pick the oiled heap into your hands and compact it into a ball shape. You may find this a little difficult at first as the oiled flour can be hot. Once you have made a ball, roll it around on the flour kept aside earlier, to coat it lightly. Keep the coated ball aside to cool. As you use up the flour mixture in the â€˜sand pitâ€™, add more into it and continue the process till all the flour are used up. Note: The amount of hot ghee you use to make a ball varies with the size of the ball you want. Adjust this quantity to your own liking. This recipe is brought to you by our Guest Chef Spillay who blogs over at A Pot of Gold. Spillay is a Malaysian who currently resides in Australia with her husband and two gorgeous boys. Looks like an interesting recipe. I wonder how many weight watcher points they have? SP,drooling over the ghee balls, yet again! Yummy! Congrats on being published here Spillay!! My goodness, evil evil evil, just as I am about to go to bed and I see sugary ghee balls. I haven’t had these treats since…since…a long time ago! @ Elaine: Ha! HA! I know – they are sinful, aren’t they! I came here last time but missed to comment. Congratulation’s dear. they look so yummy ! I used to make this dish… I use patan ghee in it and it makes it more delicious..
I’m a terrible cook, and need some advice. I tried the recipe today, and it didn’t taste right. I suspect it’s because i may have let the flour roast for too long in the pan, and some of the burnt bits of flour have imparted a slightly bitter flavor. How long does it take, in general, to roast about 2 cups of flour over medium heat? Is it just a few minutes? I started to smell the aroma fairly quickly into the roasting process, about 5-7 minutes or so, while i was stirring it constantly. But it seemed to happen too fast, so i kept going for another 15 or so minutes. The overall color of the flour became slightly darker. I think that’s my big mistake. Could you provide some advice about the roasting process,, please?